I imagine that's what will happen in NYC next Friday. Here's part of the e-mail I just received. 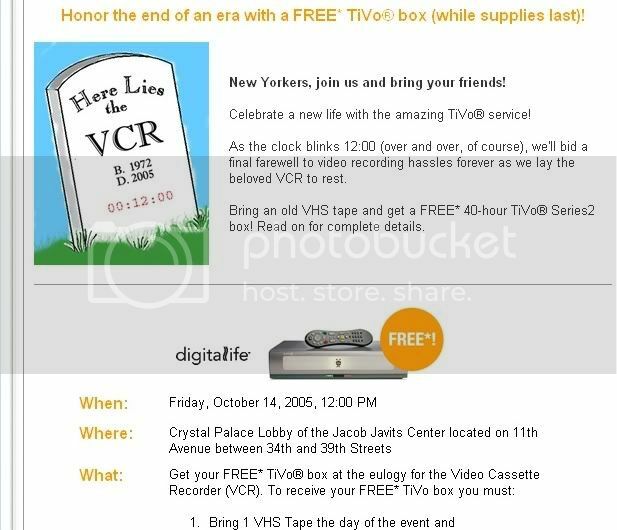 The #2 requirement, which I inexplicably cropped out, is that you have to sign up for TiVo service. Anyway, this is a cute lil' stunt - but I have a funny feeling they're likely to be absolutely overrun with people. When I first read it, I instinctually thought, "should I take off of work?" And I already have freaking TiVo. Seeing as you can currently buy the 40-hour box for $50 after rebate, it's really not that much of a savings - and much more hassle. I hope people beat each other up.